Bikes are welcome on Space Coast Area Transit buses, based on space availability. Just lift your bike on to the bike rack and secure it. It’s that simple and there’s no extra charge for bikes! Space Coast Area Transit’s public bus service is committed to the mobility of all the people who live in Brevard County, including those who choose to use a bicycle for all or part of their trip! Bikes are welcome on Space Coast Area Transit buses. Just lift your bike on to the bike rack and secure it. It’s that simple, and, there’s no extra charge for bikes! The Space Coast Area Transit system provides bicycle racks on all buses operating on fixed routes throughout Brevard County. Each rack holds up to two (2) full-size bikes, positioned on the front of the bus. The bike rider signals the bus driver letting him/her know the bike needs to be loaded and then deploys the bike rack, loading the bike. Biking is great exercise and wonderful for the environment! Space Coast Area Transit does not accept liability for damage to bikes. WHAT IF THE BICYCLE RACK IS FULL? If the rack is full when the bus pulls up, the driver, at his/her discretion may allow the bike to be carried on board the bus by the passenger. The driver’s approval depends upon the number of passengers and the number of wheelchairs or scooters that are aboard the bus. If permitted on board, the bike must be secured by the passenger. Should the driver not allow the bike on board, the bicyclist will have to wait until the next bus arrives. This guidance is provided to safeguard the passengers. Loading your bike only takes seconds. Pull down the rack in front of the bus. If the rack is already full, wait for another bus or ask the driver if you may bring your bike on the bus. Place your bike wheels into the slots labeled “front” and “rear”. The first bike mounted on the rack goes in the space nearest the front of the bus. Raise the bike support as far as possible. Be sure it rests on the front tire, not the fender, and holds the bike securely. The spring in the arm will keep your bike in place. To unload, release the support arm and lift the bike from the rack. Restore the rack to the “up” position, if there is no other bike on board. Happy biking! Please note that Space Coast Area Transit does not accept liability for damage to bikes. Bicycling, a popular Florida pastime is a fun way to exercise. It’s also a clean-air commute! Now, you can bike and ride with Space Coast Area Transit on any fixed route throughout Brevard County. Bike and ride to work, school, malls, libraries, parks or just about anywhere in Brevard County. 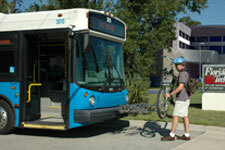 All Space Coast Area Transit buses are equipped with bicycle racks for your convenience. Subsequently, there’s no need to call ahead to determine which routes will accommodate bikes. For additional information on Bike on Bus, call 321-633-1878. In South Mainland, call 321-952-4672, or E-Mail Us!